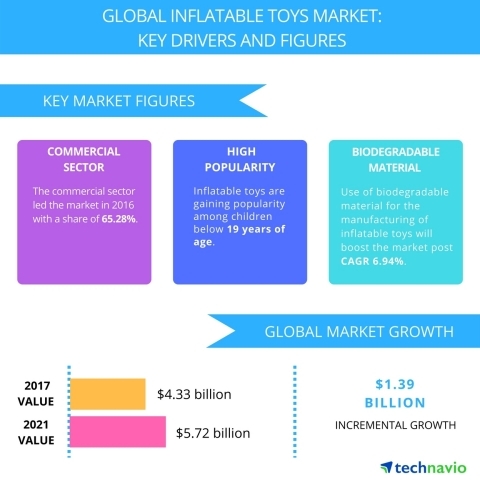 LONDON--(BUSINESS WIRE)--Technavio analysts forecast the global inflatable toys market to grow to USD 5.72 billion by 2021, at a CAGR of close to 7% over the forecast period, according to their latest report. The research study by Technavio on the global inflatable toys market for 2017-2021 provides detailed industry analysis based on sector (commercial sector and residential sector) and geography (the Americas, APAC, and EMEA). Inflatable toys are objects that are inflated with air, hydrogen, helium, or nitrogen. They are used for leisure activities and entertainment. The Americas generate the highest revenue for the global inflatable toys market, and is likely to experience high growth rates over the forecast period. “Inflatable toys are hugely popular with young kids, and the rise in global population of individuals aged below 19 is driving the increased sales of these toys. Increased standards of living and disposable incomes are also positively impacting the market growth,” says Ujjwal Doshi, a lead analyst at Technavio for gaming research. The growing popularity of inflatables is also contributing to the growth of the rental market for toys, which include inflatable pools, pool toys, slides and bounce houses. Inflatable toys are becoming popular in the residential sector as they are easy to transport and store when deflated and are ideal for outdoor vacations, such as camping. The per capita disposable income of individuals in developed and developing countries is increasing due to a spike in number of double income households. The rise in disposable income is resulting in increased recreational spending, which has directly impacted the demand for inflatable toys. Demand for inflatable toys such as inflatable pools and related pool toys has greatly increased due to the unique experience they offer. Also, many vendors are using safe and eco-friendly manufacturing materials, which is likely to further boost the market. “Inflatable toys like swimming pools and inflatable swans used in the residential sector are made of affordable materials such as PVC. The material is versatile in nature and can be molded into different shapes such as ducks, penguins, and dolphins to attract children,” says Ujjwal. A basic inflatable swan can be priced as low as USD 9, which makes it an affordable option for consumers. Also, toys such as inflatable slides and inflatable castles are easily available for rent at an average cost of USD 80, which attracts more consumers to rent these products. Become a Technavio Insights member and access all three of these reports for a fraction of their original cost. As a Technavio Insights member, you will have immediate access to new reports as they’re published in addition to all 6,000+ existing reports covering segments like internet and e-commerce; media and entertainment services; and publishing and advertising. This subscription nets you thousands in savings, while staying connected to Technavio’s constant transforming research library, helping you make informed business decisions more efficiently.